If stunning sunrises & beautiful views are something you look for in holiday accommodation, you should consider Hotel Islazul Punta la Cueva. 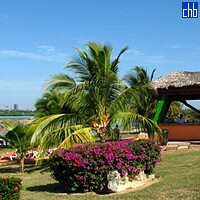 This hotel also represents an inexpensive choice for anyone wanting to explore Cienfuegos or those on diving trips. Punta la Cueva hotel is on the east side of Cienfuegos Bay & just a few minutes’ walk from the historic centre of Cienfuegos. The hotel is set in tropical gardens with a small beach & its own pier, which is a perfect vantage point for watching sunrises & sunsets. Islazul Punta la Cueva has a good swimming pool & facilities including a buffet restaurant, bar, nightclub, shop & car parking. The hotel serves decent quality, simple food & a range of drinks at inexpensive prices. Punta la Cueva hotel is a good choice for anyone looking to experience the natural beauty of the area, particularly from its pretty pier. Punta la Cueva has 67 ensuite, air-conditioned rooms which all have a fridge & satellite TV. The rooms are spacious & clean, though the décor is rather dated.